Alfred James Golden Jr. was born July 4, 1969 in Colts Neck. Al was a bright, hyperactive athletic kid who loved football. He devoured information on the game and starred at tight end for Lou Montanaro’s Red Bank Catholic Caseys. Al would get so excited during games that he often hyperventilated, and would have to breathe into a paper bag. Al often used his size and speed to intimidate opponents by running through them instead of around him. Al’s spirited play and head for the game caught the attention of Penn State. He accepted a scholarship and after red-shirting the 1988 season, he made the varsity as a sophomore in 1990. 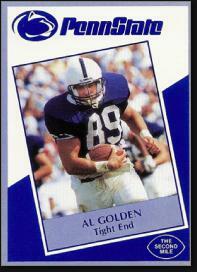 As a junior in 1991, Al won a starting job as a blocking tight end and was a member of the Penn State team that upset #1 ranked Notre Dame. His touchdown catch enabled the Nittany Lions to erase a 21–7 deficit in the fourth quarter. Al caught a pass from Tony Sacca on the 3 yard line and dragged two defenders into the end zone. Penn State won 24–21. Al captained the team as a senior in 1991. They finished with a #3 national ranking after blowing out Tennessee in the Fiesta Bowl 42–17. Al went undrafted but signed a contract with the New England Patriots. He played briefly on special teams. With little prospect of an NFL career, Al turned to coaching. He returned to RBC as Coach Montanaro’s offensive coordinator in 1993, rewrote the team’s playbook and sent his résumé around. The following season he joined the Virginia staff as a graduate assistant while he earned his masters in Sports Psychology. He coached the linebackers in 1995 and 1996, including James Farrior and Jamie Sharper. Al moved to Boston College in 1997 and coached the linebackers for three seasons. After spending 2000 at Penn State as a recruiting coordinator, he was hired by Al Groh to become UVA’s defensive coordinator. At 32, he was the youngest defensive coordinator in Division 1-A. His 3-–4 defense turned the Cavaliers into one of the nation’s toughest teams to score on. Al got his first head coaching job with Temple in 2006. The Owls had just been booted out of the Big East for non-competitiveness. It took four years, but Al built a winner, fashioning a 9–3 record in 2009. They won 8 games in 2010. Al’s name surfaced in just about every major coaching sweepstakes in 2009 and 2010. In 2011, he moved to the University of Miami. After a 6–6 season, the Hurricanes improved to 7–5 in 2012. The ’Canes got off to a roaring start in 2013, winning their first seven games to earn a Top 10 ranking. A loss to powerhouse Florida State was followed by two more defeats, derailing a promising season. In 2014, the team cratered to 6–7 despite a talent-laden roster. Al was on the hot seat from the start of the 2015 campaign. A 58–0 home loss to Clemson in late October led to his dismissal. He was later hired by the Detroit Lions as a tight ends coach. Al’s college coaching record stood at 59–59 heading into 2016. He was being interviewed by several programs as both a head coach and offensive coordinator.